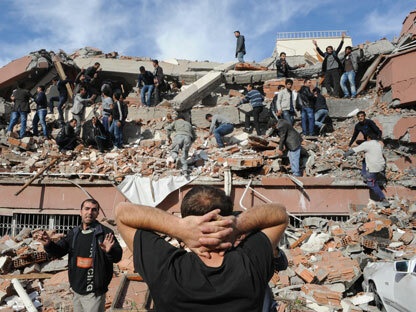 A powerful 7.2-magnitude earthquake struck eastern Turkey on 23.10.2011, collapsing dozens of buildings into piles of twisted steel and chunks of concrete. Desperate survivors dug into the rubble with their bare hands, trying to rescue the trapped and injured. State-run television reported that 45 people were killed and 150 others injured in the eastern town of Ercis, but scientists estimated that up to 1,000 people could already be dead, due to low housing standards in the area and the size of the quake.